By Staff Writer | Go to the original story. A global race is on to tap solar energy for long-term sustainable energy security by countries around the world. Many developed and developing countries are building new solar power plants in their desert backyards. In the US, a vast glittering Ivanpah solar facility will be commissioned by the end of this summer. It will produce 392 megawatt electricity, making it the largest concentrating solar power (CSP) plant in the world. In the desert near Abu Dhabi, Middle East’s first large CSP — Shams-I — has already been commissioned, producing 100MW of electricity. The Saudis have bigger and ambitious plans for electricity from renewable sources. They want to produce 54,000MW from renewable sources, including 41,000MW from solar, by 2030. 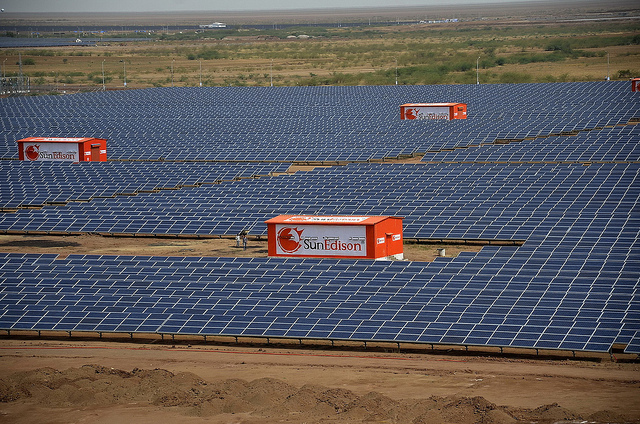 In South Asia, India inaugurated a 600MW solar power generation facility at Charanka in the western state of Gujarat on April 19, 2012. The project was completed with the US help. Energy-starved Pakistan also has vast deserts but little plans to harness this abundantly available cheap source of energy. Pakistan can learn a lot and benefit tremendously by embracing the new technology to tap solar electrons. But despite facing crippling power crisis, it still lacks political will. The recently-announced energy policy offers little hope for its photovoltaics future as the policy has no major initiative to tap solar energy. Europe, with its mostly overcast skies unfit to pull electrons from sun rays, has even bigger dream. It wants to generate solar power in Africa and transport it through undersea transmission cables to the continent to meet its future energy needs. This emerging reality of today was fiction of yesterday. Photovoltaics is the promise of today and tomorrow. But this exciting promise has its own challenges which are explained by Dave Lavitan in this beautiful article published in Scientific American. Next How South Asia Can Benefit from Central Asian Energy Boom?